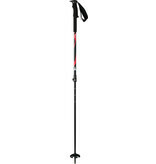 The Atomic BCT pole is a seriously versatile all-rounder for backcountry touring. It’s telescopic so you can adjust the length, and the shaft is made from an aluminum alloy developed to be as lightweight as it is durable. We’ve also wrapped the upper shaft in foam so when you’re climbing you can grip the ski pole lower down. It then has an 85mm Powder Basket, plus a Carbide tip to protect against rocks and trees.